George Walker | The Collegian First baseman Shane Conlon catches the ball just after KU outfielder Joven Afenir touches first base during the K-State vs. KU game on Friday at the Tointon Family Stadium. 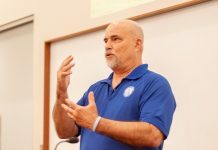 Despite creaming KU 10-0 in the first game of the series Friday, the Wildcats lost the series with subsequent losses of 6-3 and 2-1 at the hands of the Jayhawks. 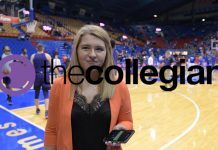 In the wake of a dominating performance on Friday night over the Kansas Jayhawks, K-State head coach Brad Hill said that the win meant nothing if the team did not play well in the next two games and win the series. 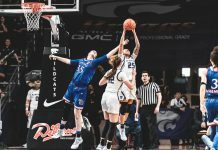 Hill’s warning proved true, as the Wildcats (18-13, 2-4 Big 12) lost the final two games against Kanas (21-11, 5-4 Big 12) on Saturday and Sunday. Friday’s game saw the Wildcats fire on all cylinders in a 10-0 win, as sophomore starter Levi MaVorhis tossed a three-hit shutout and carried a perfect game into the sixth inning. The right hander struck out four and walked two to earn his fourth win of the season on the mound. The offense was equally brilliant, banging out ten hits and drawing eight walks. While only one batter had multiple hits, every player that started the game registered at least one hit. Freshman designated hitter Tanner DeVinny registered his first career home run in the bottom of the first to drive in three runs, while senior first baseman Shane Conlon hit his first dinger of the season – a solo shot in the fourth. Despite the hot start Friday, Kansas took an early lead in the first inning against K-State starter Jared Moore on Saturday, who turned in his second straight shaky performance. The senior lefty allowed five runs – four earned – over five innings, with five walks and just a single punch out. After striking for two runs in the first inning, the Jayhawks never looked back, winning the game 6-3 despite multiple opportunities for K-State to orchestrate a comeback. 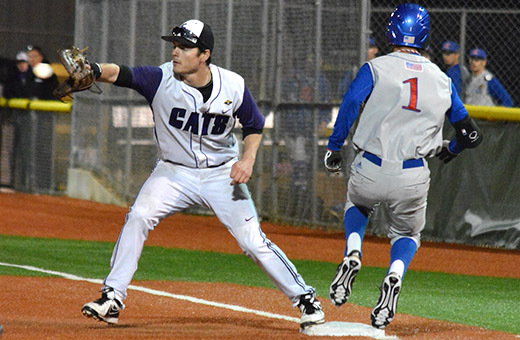 The Wildcat offense managed seven hits and seven walks, but went 0-3 with the bases loaded, including one opportunity in the eighth inning, and 1-8 with runners in scoring position. Sunday’s rubber match featured two pitchers that came into the game with big numbers: K-State’s Nate Griep and Kansas’ Frank Duncan. A freshman, Griep entered the matchup with the fourth-lowest ERA in the Big 12 this season at 1.67, while Duncan was right behind him in fifth place with a 1.69 ERA. Griep struggled more than usual despite allowing just two runs over eight innings, giving up 10 hits and walking four while only registering one strikeout. On the flip side, Duncan continued his stellar 2014 campaign, tossing a complete game and keeping K-State hitters from getting anything going on the afternoon. Despite a slew of base runners, Griep managed to hold Kansas at arm’s length for most of the game, and came out for the ninth inning to go for his second complete game of the year, but loaded the bases with no outs to prompt a pitching change by Hill. Freshman Ethan Landon continued to be the go-to guy out of the bullpen, putting out the fire and escaping the inning with no runs. In the final game, K-State managed just one base runner in the final three innings, a walk drawn by senior center fielder Ross Kivett, who had driven in the team’s lone run with a double in the fifth inning. The only other offensive highlight was DeVinny, who had a career-high three hits on the day. The Wildcats have two midweek games coming up, a home matchup against Wichita State on Tuesday, followed by a road game at Nebraska on Wednesday.